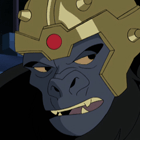 Central City is under the rule of Grodd, who plans on attacking Gorilla City with missiles. As Flash confronts the maniacal ape the team races to stop the destruction. Some magicians cut “pockets” on the insides of their cheeks to put keys in. So maybe Batman does that junk….